As a result of recent inclement weather, we have a number of questions in relation to Working from Work, and would like to take the opportunity to clarify our position. The Company recognises that employees may find it beneficial to work from a range of locations including (but not limited to) their home, with customers or clients or at co-working spaces. From time to time they may also wish to Work from Work. We recognise that some managers are concerned about staff working from work on a regular basis. This FAQs may assist you. Will staff who work from work spend their time chatting in the kitchen or around the water cooler? Most staff can be trusted to responsibly work from work. Where issues arise relating to performance or productivity, these should be raised as quickly as possible, providing specific examples. Isn’t working from work just for people without children or caring responsibilities? Anyone may want to work from work. Although working from work may suit some groups as a result of their personal situation, our Working from Work Policy applies to all staff. If I allow staff to work from work, won’t I have to say yes to other people that also want to work from work? Allowing staff to work from work does not automatically mean that you will have to allow other staff to work from work. You should use your discretion based on operational requirements. Will productivity reduce if too many staff work from work, as a result of all the meetings? Unnecessary, boring and overlong meetings can be a consequence of working from work. As a manager, it is your responsibility to ensure that working from work does not amount to a distraction from actual work. Isn’t all the unnecessary commuting detrimental to staff who work from work? Yes, it can be. However we have an excellent corporate wellbeing progamme involving free fruit that will help off-set this. How do I know if staff who are working from work are really working if I sit in a different office? You can’t monitor every individual in the office all the time. Set clear objectives for working from work staff and monitor them as you would anyone else who works for you. How should I manage work from work staff? Recognise that working from work staff are just like everyone else, only they don’t get to watch Homes Under the Hammer. Isn’t work something that you do, rather than a place that you go? PS – I totally stole the idea for this blog post from a spoof email that I saw yesterday but can’t attribute. If anyone things I have plagiarised I will remove it. It is nearly that time of year again. When we in HR have to start worrying about whether our employees will be able to behave themselves, once the Christmas spirit takes hold (or is consumed). So I thought I would help out my fellow HR folks, and share an example of a best practice policy you can use at your place, with my very best seasonal greetings. That will save you having to read all the usual rubbish and clickbait that gets published in December. The aim of a Christmas party is to foster a greater sense of team spirit within the company, giving everyone the chance to meet and socialise in a relaxed, informal and enjoyable environment, and for the company to shows its appreciation to employees for their commitment and effort during the previous calendar year. It is recognised however, that such events present a potential risk to employees and the organisation, and should be managed carefully. The aim of this policy is to provide guidance and support to both employees and managers attending the party in either capacity. Separate guidance will be issued concerning other seasonal matters, namely, office decorations, suitable Secret Santa gifts and appropriate clothing for Christmas Jumper day. This section sets out the responsibilities of the respective parties. Shall appoint an event co-ordinator to manage the party and oversee the behaviour of attendees at the event. Will undertake a full risk assessment of the venue no later than one week in advance of the event. Any serious potential risks should be flagged to the Board for discussion. Does not condone the excessive consumption of alcohol by any employee, up to and including the HR Director. Respects the needs of employees that do not celebrate Christmas. Any reference to Christmas in this policy should therefore also be assumed to include any seasonal celebrations (hereby after referred to as ‘Winterval’) that might also take place during the month of December. Shall issue formal guidelines to employees to ensure that everyone has an enjoyable time whilst exercising restrain in their behaviour towards colleagues and others. Employees are hereby advised that when attending a Christmas celebration that they do so in the course of their employment, and as such all rules, including but not limited to, those set out in the employee handbook, company policies as displayed on the company intranet, and the contract of employment, remain in force at all times. Must at all times behave in a friendly, respectful, civil and sensible manner towards their work colleagues. For avoidance of doubt, this includes the ones that they don’t like or who never take a turn to make the tea. Must not flirt with other work colleagues unless it is clear that such conduct is welcomed. Employees may wish to gain written confirmation of the same before proceeding. The HR department can provide a sample flirtation pro forma. Will not photocopy any part of their anatomy using company equipment under any circumstances. Should not under any circumstances vomit as a result of consuming excess alcohol. In the event this occurs, the company reserves the right to deduct monies from future salary payments to pay for any resulting dry cleaning requirements. Attendance at the party will be taken to amount to agreeing deductions under the Wages Act for this purpose. Should not be involved in brawling or fighting, attempted or otherwise, towards other colleagues, taxi drivers or staff of the venue in which the party takes place. Should consume alcohol responsibly and for the avoidance of doubt should not get completely and utterly pissed / have to be carried out of the venue. Will not use the Christmas party to address matters of pay and benefits with the CEO or any member of the HR Department. Are hereby advised that if they agree to attend the company funded Christmas party but fail to attend, a sum of money equivalent to the cost of one turkey dinner and one mince pie (with brandy butter) will be deducted from their January salary payment. The Company will not seek reimbursement for the cost of any sprouts provided, which it recognises are a fundamental Christmas requirement even if they are truly hideous. Employees will be expected to sign the Christmas Party Attendance Agreement (see Appendix One) confirming that they understand what is required of them at the event in terms of appropriate behaviour and agreeing to act in accordance with all relevant HR policies at all times, including but not limited to, the Equality Policy, the Bullying and Harassment Policy, and the recently updated ‘No-Fun at Work Required’ Arrangements. Employees are further advised that a serious breach of any company rules during the course of any Christmas celebrations may lead to disciplinary action in accordance with company policy, up to and including dismissal, following a reasonable investigation (as defined by BHS Ltd v Burchell). The company commits to following the ACAS code of practice at all times should such an eventuality arise. All employees are hereby wished a very merry Christmas (or equivalent celebration) from the HR department. So are this lovely lot. There will probably be cupcakes. There had better be cupcakes. It isn’t a HR conference without a cupcake. Speakers include top folks like Tim Scott, Sukh Pabial and Inji Duducu. And some other people too probably, in addition to my friends from Twitter. More of that here. There is a drinks reception at the end of day one. With wine. (Behind me in the queue everyone. Please note exhibitors – will tweet for fizz). There will be conference swag. Stock up your stationery cupboard for free! Quality Street and Celebrations will so prevalent in the exhibition, a world shortage could ensue. You can try and get a selfie with Peter Cheese. There will be some jolly good learning. 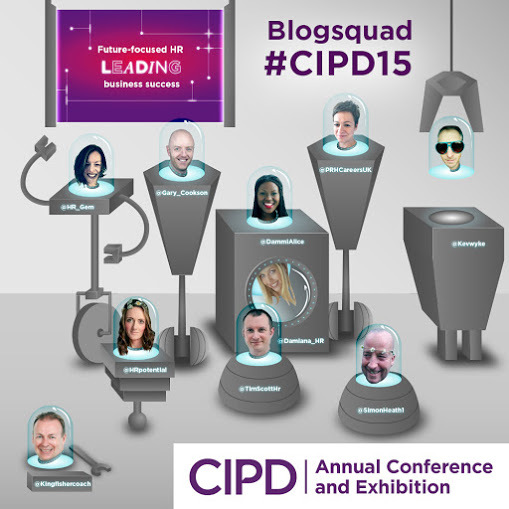 Actually, thinking about it, I probably should have put this higher up the list…..
See you there HR chums!